Following a successful presentation at the Ealthy Conference in Bern, Switzerland, in October 2017, an article was published in the next issue of the Ealthy magazine. 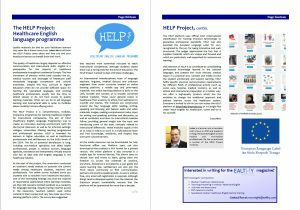 The article summarizes the benefits of the HELP project, highlights its innovative aspects and invites readers (language teachers for healthcare) to try the platform themselves. Publication details: Ealthy magazine, ISSN 2571-533X, Issue No. 6, December 2017, p. 13-14. Online.